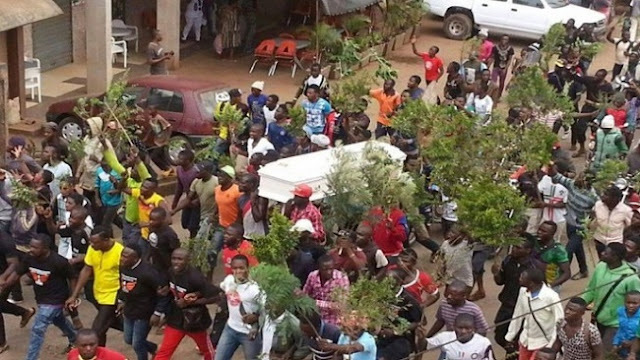 Omoyele Sowore, an activist, has called for an end to the bloodshed in Anglophone Cameroon, noting that every African life deserves to be protected. He also called on the international community to look into events in Cameroon for the sake of posterity. Meanwhile, Jerry Rawlings, Former Ghanaian Head of State and President of Ghana, has described the violence in Cameroon as a “horrible situation” and stated that France and Cameroonian leader Paul Biya cannot escape blame for the atrocities in the Anglophone half. TakeItBack movement led by Omoyele Sowore, a presidential aspirant in the forthcoming elections in Nigeria, at his office in Ridge, Accra, Ghana. He expressed worry that the situaton in Cameroon hasn't been receiving consistent media attention because of the interest of some powerful western powers in the country’s resources. Giving an eyewitness account of the happenings in Cameroon, Togolese Activist, Farida Nabourema, who is part of the TakeItBack team and was recently in Cameroon. “The week I was there, they actually shot four young men. We were going into town and a woman stopped us where there were four corpses of Anglophone Cameroonians. She said the four were killed in an extra-judicial manner. She added that the family later confirmed that one corpse was deposited at the hospital, while others were taken away by the military. She also spoke of widespread burning of villages, which she described as ethnic cleansing.